If the SD (Secure Digital) and or the CF (Compact Flash) socket on your iPAQ 200 Series has stopped working then this is the necessary repair to restore your iPAQ to working order. 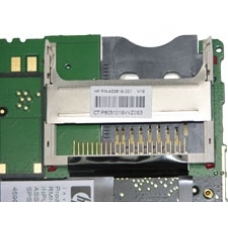 This repair will cure the majority of SD / CF card socket related problems. Correcting faults including broken SD card locking mechanisms, bent CF card socket pins and damaged read / write pins inside either of the sockets.